The Rabobank Amersfoort Jazz Festival is regarded as one of Europe’s hottest open-air jazz events. And sizzling South African jazz has become a much-anticipated staple on the programme menu in recent years, with several SAMRO Overseas Scholarships alumni heading to the Netherlands to perform original material, network, collaborate and return home feeling creatively reinvigorated. Trumpeter English, the winner of the 2012 SAMRO overseas scholarship for jazz instrumentalists, can be seen in action during the Concert Evening for this year’s SAMRO Overseas Scholarships Competition, taking place at the Linder Auditorium on Saturday 18 August 2018. As part of the evening’s entertainment, English will perform Pledge for Peace, a suite written for Nelson Mandela, who would have turned 100 this year. Bassist Concord Nkabinde, another frequent SAMRO collaborator, in collaboration with David Klassen will be performing part of two songs from their project Nelson Mandela – The Song Lives On as a dedication to Madiba. Both English and Nkabinde have had the pleasure of playing at Amersfoort, thanks to the initiative of Professor Karendra Devroop of the UNISA Foundation, who invited the SAMRO Foundation’s André le Roux and others to experience the Dutch-South African Jazz Expedition at the 2016 edition of the festival. 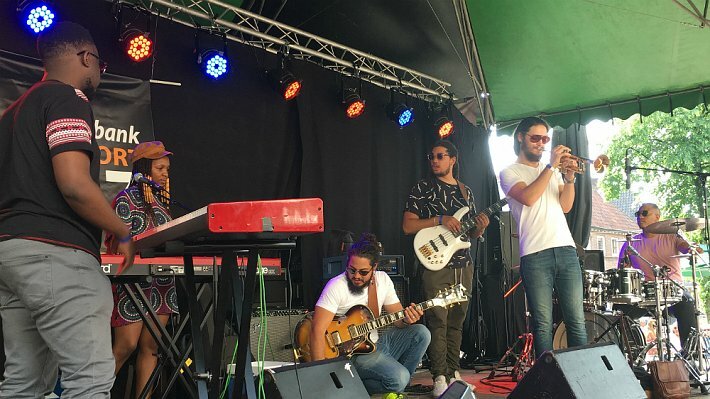 Ten South African jazz musicians performed there and, as part of a cultural exchange, 10 of their Dutch counterparts came to play in South Africa. Nkabinde and trumpeter Mlangeni (a SAMRO Overseas Scholarships finalist in 2012) were among that South African cohort performing at Amersfoort in 2016, which has led to a succession of fellow local jazz cats making a splash at the festival. They agree that being able to perform, mingle with their international peers, share ideas, absorb fresh inspiration, play for international audiences, meet concert promoters and attend master classes has been invaluable to their profile and professional growth. Nkabinde maintains that events such as Amersfoort offer “an effective tool to place our African agenda at the global table”, particularly in a climate where musicians often have to resort to playing cover versions to make a living. Sikhakhane believes the festival is an ideal way to build a global network and grow as a musician. “To get an opportunity to share music with fellow improvisers is always a pleasure, an opportunity to learn and execute positive vibrations through song,” he says. At this year’s festival, last year’s SAMRO scholarship winner, Ntando Ngcapu, and English hooked up with the 2018 and 2017 Standard Bank Young Artist winners for jazz, pianist Thandi Ntuli and bassist Benjamin Jephta, as well as guitarist Keenan Ahrends, to form the All Star South Africa Band as part of the Laureates Festival. Ntuli, Jephta and Ahrends are all previous SAMRO scholarships semi-finalists or finalists. Pianist Ngcapu, who had the privilege of attending jazz master classes by leading Dutch musicians, says he loves to have fun on stage and interact with jazz lovers – and Amersfoort certainly delivered! Nkabinde has the final word on the incalculable value of exposing South African jazz talent on international platforms such as Amersfoort: “I feel that this initiative can only benefit our South African jazz sector at so many different levels. Obviously, the interaction is not only at a musicians’ level but also an interaction between festivals and music institutions. South Africa’s young artists were able to attend Amersfoort thanks to the invaluable partnerships with the Netherlands performing rights collection agency SENA, the Rabobank Amersfoort Jazz Festival, Alexander Beets of Jazz NL, Karendra Devroop of the UNISA Foundation, the Standard Bank Joy of Jazz and SAMRO.